Dominick Thomas Zanni was born on March 1, 1932 in the Bronx, New York. The right handed pitcher was signed by the New York Giants in 1951, but never got to pitch for New York in the Polo Grounds. He spent seven years in the minors before getting to the big leagues. His first season was rough, as the big league club got to the World Series, Zanni went 1-12 in the low level of the Giants farm system. In 1952 he rebounded to a 20-8 record getting pushed up to Muskogee in the C level. In 1954 he pitched a no hitter, getting future Baltimore Orioles manager Earl Weaver as the last out. In a 1994 interview Zanni said "I'll never forget Weaver saying, 'just throw a strike, buddy, and that's the end of your no-hitter.' But he just popped it up to second. "That's Weaver for you. 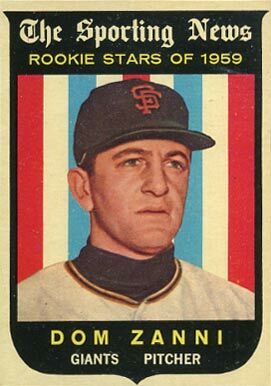 He would bother you for everything...."
Zanni posted two 15 win seasons along the way &; in 1958 after going 14-11 at AAA Phoenix he made it to the Giants staff, who were now in San Francisco. At the end of September he earned his first win in his MLB debut, coming against the St. Louis Cardinals. He beat Sam Jones while pitching four innings of relief. Although his 1959 Topps baseball card listed him as a rookie star for 1959 it didn’t quite work out that way. He would bounce back & forth to the minors his entire career. He pitched in the big leagues with the Giants (1958-1961) the Chicago White Sox (1962-1963) & Cincinnati Reds (1963-1966). He pitched in the minor leagues a total of 15 seasons going 140-122 with a 3.44 ERA. 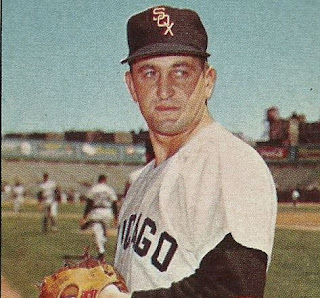 He saw the most action with the White Sox in 1962 going 6-5 with five saves in 44 games pitched, posting a 3.79 ERA. He came to play the A.L. New York club that year & everyone he ever knew in the Bronx wanted free tickets. He said in the book “The Giants of ‘58” that he left tickets for about a million people; his grammar school & his high school were also in attendance. He was so excited when manager Al Lopez called him in to pitch in relief.Lopez had t yell at him to get out of there, so he could start pitching. In a late July series, he struck out four batters (Clete Boyer twice, Tommy Tresh & Elston Howard) pitching 2.1 innings of work. His friends & family in the stands, were thrilled. Retirement: In his seven year career he was 9-6 with 10 saves & a 3.79 ERA in 111 games pitched. After his playing days he became an insurance agent & has retired on Long Island in the town of Massapequa.